Fox are celebrating their forty-year anniversary in 2014, and this week Fox Racing are getting stylish – releasing a limited 40th Anniversary tribute collection. The collection sits within their 360 racing gear, and pays tribute to one of their very earliest sets of custom racewear. 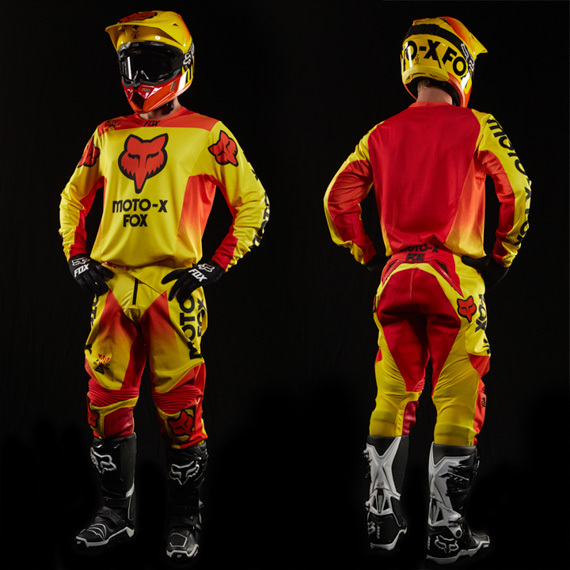 Originally designed for the 1977 AMA 125 Nationals Team Moto-X Fox, the collection features the retro yellow, orange, red and black Moto-X Fox livery and looks absolutely awesome. The 40th Anniversary LE 360 racewear set includes helmet, jersey, pants, goggles, gloves and boots. In terms of technology and fit, the design is anything but retro featuring an articulated fit designed for aggressive racing positions. The helmet will keep your noggin in order with its fancy multi-composite technology construction, dual density EPS liner and Fox’s MIPS brain protection technology. And for when you hop off the bike and back into the real world, a full line of Forty-Year Anniversary t-shirts, hats and hoodies is available as well. It’s all looking great, and with its limited run you’ll need to get in quick! Head to Fox Racing’s official site here to check it out.